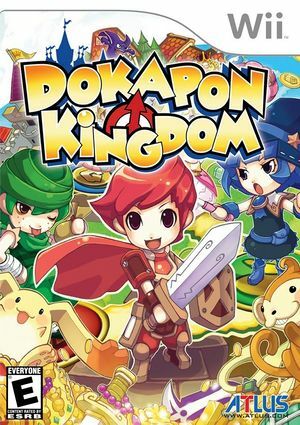 Dokapon Kingdom is a land of wealth and riches ruled by a gold-loving King and his daughter Princess Penny. One day, monsters begin appearing all over the realm, assaulting the towns and stealing all of the empire's wealth. The King, unable to collect taxes from his impoverished citizens, calls for heroes from across the land to come and rid his monarchy of these monsters. The prize for the hero who is able to free the land: The hand of Princess Penny and rule of the Kingdom itself! Warning : relationship counseling not included! Dokapon Kingdom is capable of using both GameCube controllers and Wii Remotes. If a physical controller is set to emulate both a GameCube Controller and a Wii Remote concurrently, it will operate both devices at the same time. To fix, migrate controls to use separate physical controllers. Checking "NPC battle skip" within the game causes a strange bug that randomly overlaps the AI's battle music over the player's music. This is not a problem with Dolphin, as this bug exists on the Wii console. Do not turn on "NPC Battle Skip" to avoid this problem. The graph below charts the compatibility with Dokapon Kingdom since Dolphin's 2.0 release, listing revisions only where a compatibility change occurred. 3.0-226 Windows 7 Intel Core 2 Duo E6600 @ 3GHz AMD Radeon HD 6870 Had an issue with the Nintendo Wii Remote. Noticeable lag, and sometimes the game wouldn't respond to the controller. Checking "Alternate WiiMote Timing" under the game's properties fixed this for me.